One of my favourites. 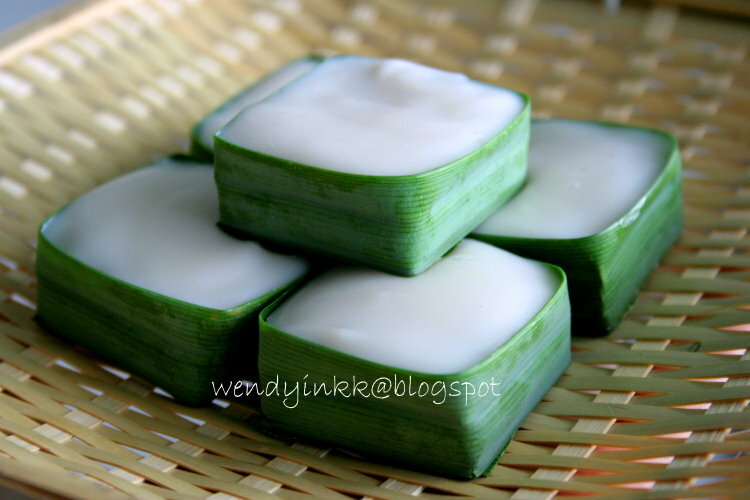 If you have an big bush of pandan and don't know how to use it up, make this. This kuih needs a lot of pandan leaves. I made this because I was given a lot of it by Mike's aunt. Well, besides that you can also cut up the pandan and use as cabinet deodorizers, it prevents pesky cockcroaches. 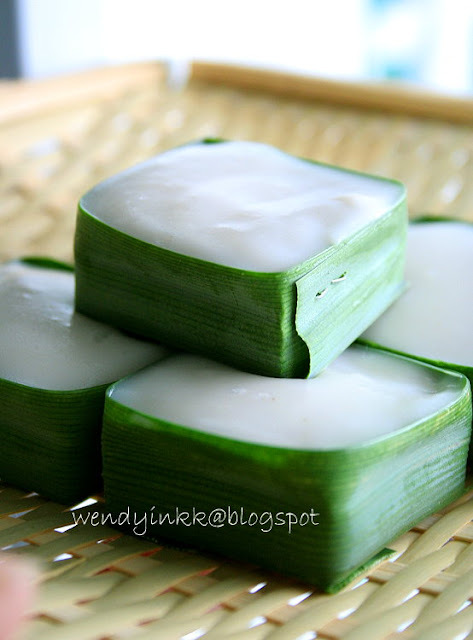 Not a must to make edible things with pandan. I used to make this with my students back in Selancar, but that time it was with cornstarch. Cornstarch yields a softer kuih compared to mung bean starch, so feel free to use cornstarch if you can't get mung bean starch. I used to teach them using spoon measurements, with 2 Tbsp of starch per cup of liquid. And this time, I worked with weight and readjusted the top layer's ratio so that the texture will be even when chilled. Coconut milk layers tends to harden more due to the high fat content so the starch ratio must be lower. I've tried it 3 times to get the texture I'm looking for. Coming to that lesson with my students... I remember I taught them the technique and told them to make 5 cases each at home to bring for the cooking session the next time. One student, Syikin (now on my FB list, and she reads this blog too) came empty handed. I asked her why and she told me, the pandan bush at home were all eaten by the wild pigs. LOL. I was almost ROTFL. I have never heard of pigs eating pandan leaves and now I have. I guess it must be delicious! If you frequent Taman Sri Muda, Shah Alam's Ramadhan Food Bazaar, then you will encounter a van that sells only this. But they call it Tepung Pelita instead, of which isn't so accurate. 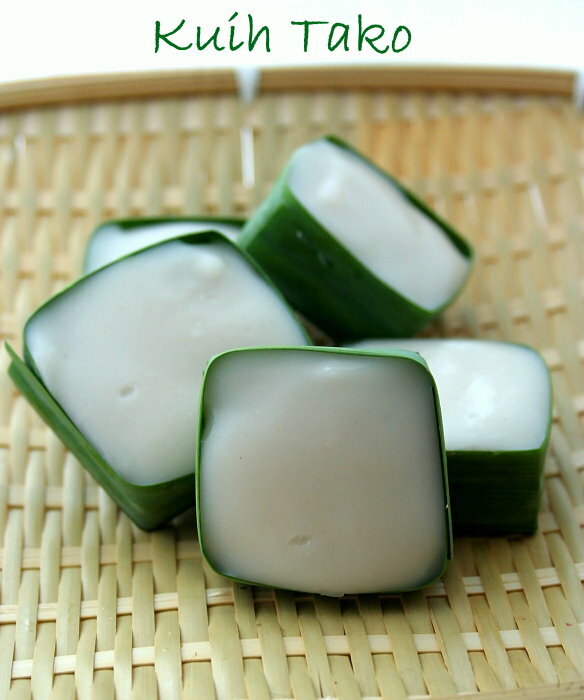 The real tepung pelita is made with rice flour without waterchestnuts, and steamed in banana leaves, almost similiar to kuih limas. Or are they (TP and KL) the same? LOL. Step by step pics are from 1st attempt where the starch content is higher for coconut layer, which is why they look thicker. 1. Prepare pandan layer. Mix everything together and cook on medium low heat until it looks transparent and thick. 3. Prepare coconut layer. Mix everything together and cook on medium low heat until it thickens. Taste, it should no longer taste floury. 4. Spoon over the pandan layer. 5. Let cool down to room temperature and it will harden. Best served when chilled. *Note: I won't be able to tell you how much this will yield as it depends on how big your pandan leaf is, of which affects how big your casing will turn out. If you have excess, just put them into small tea cups. Works well this way too. This is my favourite too!! Wanted to make this too but the thought of making the "pandan leaf casing" seems to be "mar fan"! Waa...I love eating this, my favorite dessert, especially when served chilled! Yours have such smooth tops, better than those bought outside! Oh, my favourite too. I'll sure have three whenever I visit a Thai Restaurant. May I check with u mung bean starch same with Hun Kwe flour? Thanks in advance. 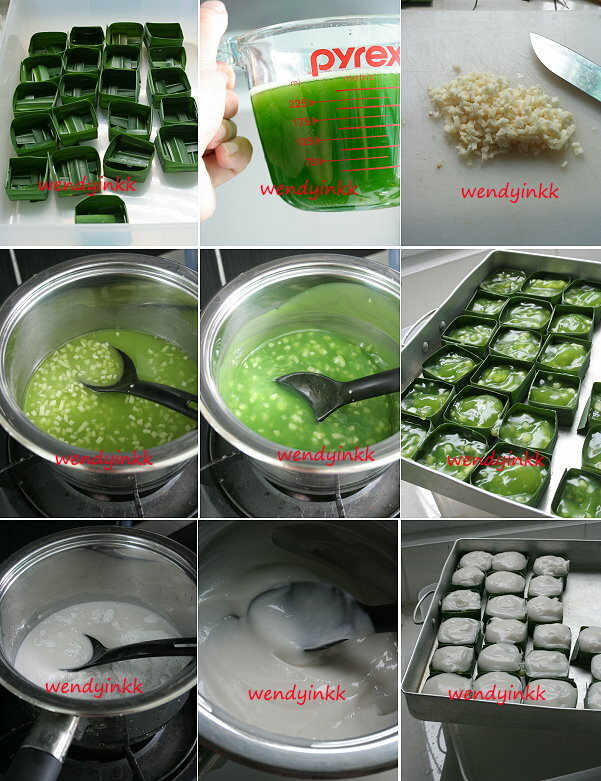 i thinking to make this too but the pandan leaves in my backyard almost finished used up for making kuih in these few weeks, hehehe..Thanks for the detail step on how to make the case..will try out soon when my pandan leaf enough for supply.. Appreciate the tutorial! this is delicate origami work and I hate handicraft but love this kuih very very much .. I like to eat this but it's labour intensive. Oh, Congrats on your recent achievement! This is a lovely kuih! Thanks for sharing the steps on how to prepare the casing, I love it!! looks like making the casing is even more work than making the kuih itself! unless like what you said, do it in cups. I'm very lousy doing all this wrapping, bak chang i dont know how to fold, kuih koci also not very sure..maybe nasi lemak can lah..ugly one! 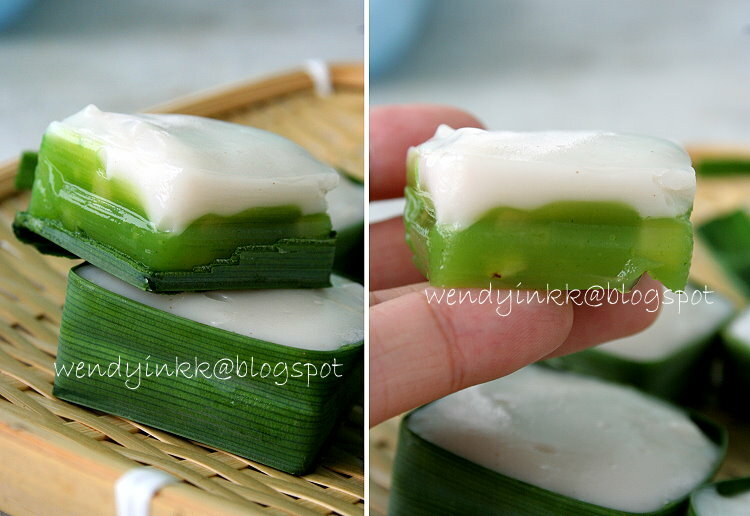 I wanted to make this kueh for the longest time but can't do that without fresh pandan leaves. The one here are all the frozen one so they are way too soft to make this. Thanks for the step by step tutorial on folding the casing. When I saw the first pic in yr post, my heart skipped a beat. It's a dessert which I've wanted to do for the longest time. But after two failed attempts, I've given up hope... Until yrs came along! Yr recipes have never failed me so I guess I will give it another shot. Thanks, Wendy! Oh, things always turn into an artform in your hands. I hope you make these. It's not hard, just like folding a box, once you get the hang of it, it's very easy. Use tea cups then, works the same. those sold also smooth leh... at least those that I saw. Oh yeah, u made soooo much kuih la lately. It's not hard, my students can do it, so can u! Ng gan nan jou la, lei jou yat chee, lei jau sek ga la. thanks, skip the casing and it's really to make. kalo guna tepung kacang hijau, rasanye lebih original sebab hoenkwee ada tertambah bahan perisa. If you can wrap loh mai chee.. aiyor this is kacang putih la. Set them in banana leaves then. I saw some do it this way. Or just use cups.. eh, do in your Pewter cups. Oh what went wrong, may I ask? Maybe I can help u trouble shoot. It's actually a very easy kuih to make, provided the measurements are correct. 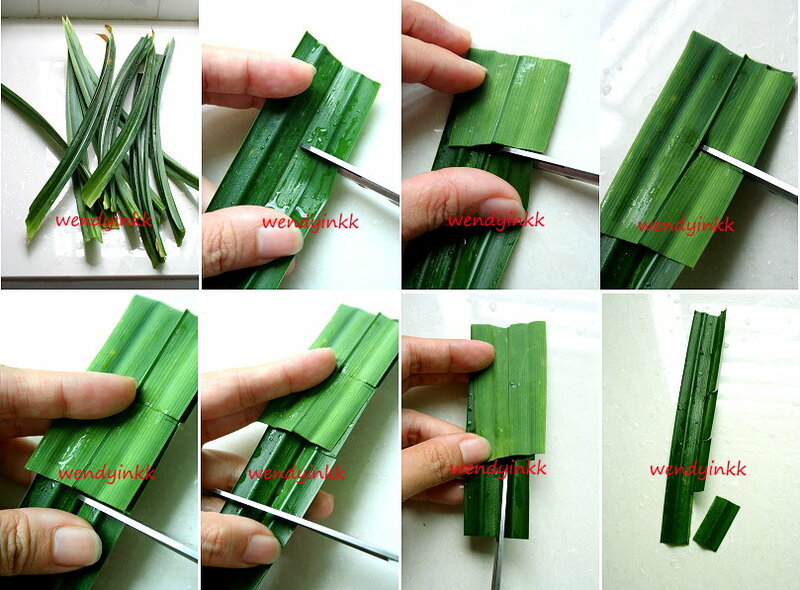 Blend pandan leaves with water and strain. Use search button on right panel and search "pandan juice" and you'll get my post on how to do it. Awesome!! Thank you so much. Even though I'm new, I love your blog already. Oh, so this the difference between tako and pelita! My mum taught me to do this once(her giant pandan plant was growing like nobody's business---later we found out that it's the smaller leaf species which is more fragrant)She was also confused, said "dunno why some call this pelita"...But some of my malay friends would make the pelita this way oso leh, instead of using banana leaf. 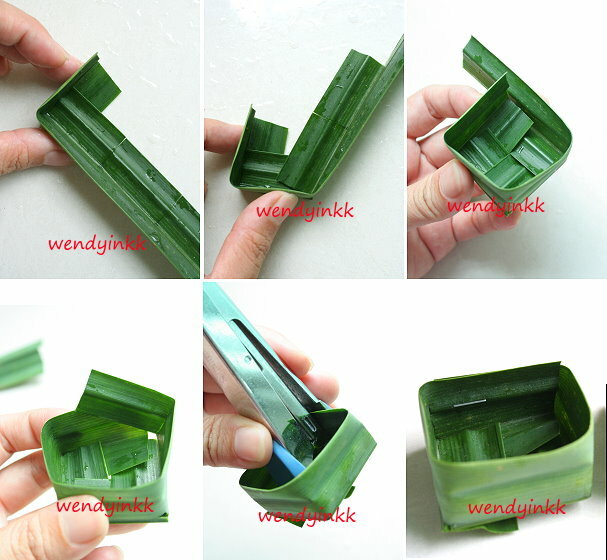 Hey, even you've shown the step by steps of folding the pandan box, it still looks abit complicated to me...LOL! You can say I'm dumb and blur....this is Reese!!...haha! But I love it if you don't mind to show me one day...hehe! I remember helping my mom to make the casing for kuih tako.. lots of work but everything was so worth it! I sometimes wish we had a pandan plant in our backyard....because I LOVE the flavour of pandan, but pandan leaves are so hard to find here (fresh ones anyway). I've actaully wanted to make kuih tako for a long time, because I've had something similar at a thai restaurant a very very long time ago (it's probably a different thing though) but there's only one layer (the white layer). I'll have to try this recipe the next time i get my hands on some pandan leaves! Oh yes I remember the pandan leaf you told me. Was it growing under shade? Or under the sun? Actually very easy one la. Ok lor, if can, show u all next time. Oh yes, absolutely worth it, but it does feel a bit sayang to see ppl throwing away the cases after eating. LOL. Take note that with cornstarch it will be softer. I can smell pandan here. This is nice. My mum's pandan? Oh, it was growing on the ground under full sunlight... my mum got the one with smaller leaves later and replaced the big plant, it grew very big too thou not as big as the earlier plant. I was hoping to get my hands on some huuuuuuuge ones so that I can make kuih with those leaves. That's what I did too! It's just like folding a box. LOL, it flies through the internet huh. Wendy, I love your blog!!! Can I check above ingredients which enough for how many casing roughly? I plan to do more for my nephew coming birthday party. Thanks! Exactly like in the picture. 21. Thank you for your clear instructions on making the tako casing which I am delighted I was able to follow and successfully made some very cute ones. Kindly advise me is mung bean starch/green bean flour also call 'Hoon Kwe' flour? In Hokkien is called 'Ji Tow Hoon' right? I just want to be sure I will be using the right flour before I use ur Kueh Tako recipe on this weekend. HoenKwee is made from mung bean starch, but it's not pure. It has flavourings(vanillin) added in. You can check the label. And the effect is more opaque than pure mung bean starch. Sorry, I don't know any Hokkien. Look like I hv to settle with using Heonkwee flour. This is because I could not find mung bean starch/flour, neither green pea flour in S'pore. BTW, do i need to increase sugar amount for the pandan layer cos' whenever pandan juice is called for, the finished product seems to give out a bitter taste. Or shud I just settle with pandan essence and avoid pandan juice to play safe from getting the bitter taste. Let me guess. You use the young shoots and white parts of the pandan to make juice too? Thnx for your swift response. U r right, I used the entire bunch of the pandan, nothing was thrown away. Oh, how inexperienced i am and now i realise I shud not use the shoots and white parts. It's no wonder, my finished products always ended up bitter though strong fragrant pandan was there. So, that means the middle green part of the leaf shud be used only? Thanks Wendy for your knowledge and unselfish sharing. Really appreciate. I made the cute tako casings followed ur method and used ur kuih tako recipe this afternoon. The results were fantastic and kuih tako was very well received. The recipe is a KEEPER. I am so glad I do not need to buy them anymore. If I recall, I think some three years ago, the thai outlets in S'pore were selling something like 10 pcs per box for about S$3.00. It's not the amount that matters but rather I really enjoyed making the casings, not difficult at all. They were cute the fragrance of pandan lingers on my hands after making them. Texture of the kuih is the best. A KEEPER, a keeper! I can't wait to show off this skill acquired from you to my sister and her friends who are currently having holidays in USA. Thank you, Wendy for sharing your recipe. U're welcomed and I'm really happy that it was very well recieved. Looks like a science project but I want to make! Thank you, this is the best instructions I googled. can we make this in baking tray like making agar agar? This recipe's texture cannot be cut and serve, it could be too soft. If you want to do it in the tray, you have to use less liquids to make it "cuttable"
The amount of cornstarch will be different. Is the texture u had only spoondable and not removable from the mould like mine? and yes, make sure ur starch mixture is cooked properly, it should be translucent with some very small bubbles in it. If it's not cooked enough, it won't set nicely, but stay like those whitish "Gum" that I could get in those toothpaste tubes. Yes, when I scoop it up, everything just topples and won't stay in its shape (I made some of mine in containers). When cooking the green layer, the mixture turned very sticky out of a sudden so I quickly removed it from the heat and scooped it into the cups. Should I leave it to cook longer instead? the mixture is already translucent though! if the base turns sticky, but the stop still watery, cook it further until the whole thing is translucent. try it again next time. hi wendy,thank you for the detailed recipe. I tried it out yet, it didn't turn out beautifully. I've followed the ratio given but the coconut layer is watery. Hi, I tried your kuih Tako today and it didn't turn out good. The pandan layer was having a bitter taste to it also the white layer is watering went I put it in the refrigerator. Do you know what is wrong with it. By the way, I made 4 orders together. So, I don't know, if it was the problem or not. Let me know what I did wrong. Thank you. As the batter is white, is is easily undercooked. Make sure it is properly cooked. When I spooned them on, they were at the consistency of cream soup. Make sure you did the calculations right when you made a quadruple portion. The pandan taste will be bitter if you took young leaves and the white parts. The white layer shouldn't even be watery at all after cooking. Either you have miscalculcated the starch, or wrongly measured or undercooked the coconut layer. Am currently trying this recepi now..only problem am facing is the pandan layer is leaking out of my casings tho there aren't any big visible holes..Is my pandan layer too watery that's why it's leaking?? This would be my second trial trying out this dessert and again I don't know where I have gone wrong as I followed the measurements to detail. My pandan juice is nice and translucent before being cooked but as I add the green bean flour and sugar and let it cook to medium heat it starts to turn cloudy and dark green and doesn't thicken. Help!! I think you used toasted mung bean flour as you said, not the starch. The ones that are used to make tepung gomak or other Malay kuihs, right? The mung bean starch looks like any other starch, it looks like cornstarch, pure white. my green bean flour is pale yellow color and that's the only one i have which was specially bought from Vietnam by my friend as they don't have it where I am..So what can i substitue it the flour with? Cornstarch. Reduce water by 10% if use cornstarch. Hi Wendy, thanks for the fantastic recipe which I've done 2x and they turn out wonderfully! Just pour it into any cups or even box, when set, cut into square if needed. Thank you and now it's Giveaway time!!! The Finale and..... I won it?